WASHINGTON, D.C. – Ask about the horses, his agent said. As a kid, Henrik Zetterberg spent many Saturday afternoons with his family watching harness racing, also known as trotting, a popular sport back home in Sweden. It was tradition to hold off dinner until the last race had finished. For his grandfather and father, it also meant plenty of gambling. Once Zetterberg became old enough, and once he had earned enough money by playing hockey for the Red Wings, and once he had met the right trainers in the trotting industry, he eventually bought stake in four horses. “It was a pretty easy sell for me,” he says. Two grew into particularly successful racers, though one named Alex A encountered some stomach problems and died. The other three are retired, some recovering from injuries suffered on the track, but still alive. Ask about the horses? Zetterberg lights up. He has thought about the future. Talked about it, too, not long ago with Red Wings defenseman Niklas Kronwall, a fellow Swede. Together, Zetterberg and Kronwall have played 1,744 regular season games for Detroit, appeared in 246 more in the playoffs and hoisted the 2008 Stanley Cup. Born three months apart, both are now 36 years old, elder statesmen on the last-place team in the Eastern Conference. About what all this portends, Zetterberg is steadfastly honest. He’s standing in the visiting locker room at Verizon Center, cradling a hockey stick in his hands. He motions around. The good, happy things can be found here. When Henrik was younger, his father, Goran Zetterberg, suited up for several Swedish professional teams. Funny thing is, Henrik doesn’t remember attending any specific games. But the behind-the-scenes experiences constantly come back. “You always had fun,” he says. “Never a bad moment. The memories that stick out are just that time you had with the team, basically just following them around. Don’t be mistaken. Cheer and optimism alone haven’t helped Zetterberg navigate perhaps the toughest season of his career. Despite his age, the Red Wings’ captain has remained remarkably productive. Last weekend, as back-to-back losses in Columbus and Minnesota sank his team to the bottom of the conference, Zetterberg formed a club all by himself. Among the NHL’s 35-and-older crowd, 42 of whom had played at least one game this season through Monday, Zetterberg is the only one with at least 10 goals (he has 13) and 40 points (41). “He’s got a lot of fire in him,” says Dan Cleary. “He’s just willing the team right now.” A former Red Wings forward who signed after the ’04–05 lockout and spent a decade there, Cleary now helps with Detroit’s minor-league affiliate in Grand Rapids but still finds time to watch plenty of NHL games on TV. In paying attention to Zetterberg, Cleary is reminded of the ’12–13 season. 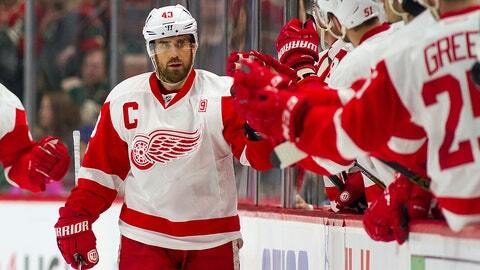 Nicklas Lidstrom had just retired, and the captaincy was passed down to Zetterberg. With four games left, on April 20, the Wings were one point out of the playoff picture. Sheer will from one person can only tug a team so far, though. Injuries have ransacked the Wings, from goalie Jimmy Howard (knee) to leading goal-scorer Thomas Vanek (ankle) to defenseman Jonathan Ericsson, recently lost for the season with a broken wrist suffered against the Capitals. They rank 26th in both goals for (2.41) and against (3.02) per game. With the trade deadline looming March 1, the odds have grown almost microscopically slim—analyst Micah Blake McCurdy pegs them at 2%—that Detroit will extend its record postseason streak to 26 years. The doors shut closed but the cameras stayed. In mid-December, leading up to their Centennial Classic outdoor game against Toronto, the Red Wings opened a five-game homestand with four straight losses. After the third defeat, 4–1 to Arizona, the documentary crew from EPIX that had been trailing the team captured the scene in the locker room of Joe Louis Arena: Everyone else seated, listening as Zetterberg speaks in a firm but sincere tone, delivering what sounded far more like a plea than a tirade. Why? “Z learned from the best,” Cleary says. In the locker room, Zetterberg often sat next to Steve Yzerman, who wore the C before Lidstrom. And Lidstrom, well, was alternatively nicknamed The Perfect Human or Mr. Perfect for a few reasons. “You couldn’t have a better role model than Nick,” says Zetterberg’s agent, Marc Levine. Five In, Five Out: Who should have made the NHL's top-100 list? Now he has taken the reins, leading in many ways. He continues to fund high school hockey scholarships for two local players each year, one boy and one girl, and won the NHL’s King Clancy Trophy for leadership and humanitarianism in 2015. Since his agent, Levine, also represents Frans Nielsen, Zetterberg put in a call during the interview period last summer and eventually helped lure the free-agent center to Detroit. (“A very strong reason why Frans came there was because of Henrik,” Levine says.) He continues to center the team’s top trio, often drawing its hardest matchup assignments at home, and leads all forwards with 19:25 ice time per game, ever mindful of mentoring young Wings like Anthony Mantha, one of his usual linemates. But it’s also about keeping those good, happy vibes. Once, Cleary had the wheels of his car replaced by neon green rims, and he figures Zetterberg at least partially masterminded the switch. The morning of the Washington game, asked for the most common current target of his gags, Zetterberg points to Gustav Nyquist, his other winger opposite Mantha. The voice from the other room is clear this time.